Tottenham are without Harry Kane for the visit of relegated Huddersfield in the Premier League, while Dele Alli is a doubt. Tottenham are home – and the new stadium has been worth the wait. Tottenham enjoyed a historic homecoming as they opened their long-awaited new stadium with a 2-0 win over Crystal Palace. New technology at Tottenham Hotspur’s state-of-the-art stadium means beer can be poured hands-free by bar staff. 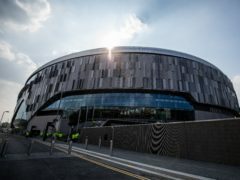 Tottenham and Saracens have agreed a five-year partnership that will see the Gallagher Premiership champions stage their annual ‘Big Game’ fixture at Tottenham Hotspur Stadium. Tottenham are ready to move into their new stadium after almost two years away from White Hart Lane. The stadium was built on the site of their old home, costing a reported £1billion. Here, Press Association Sport takes a look at the building process in pictures.